This Christmas, Brian and I are relaxing at home listening to "A Christmas Carol" by Charles Dickens. It has been a quiet holiday so far - last night we went to the midnight service at Central Presbyterian downtown. This morning, we went to First CRC for the Christmas morning service, sang "Ere Zij God", and came home. I napped, went for a walk with Brian and Izzy, and relaxed in the livingroom by the fire while Brian cooked the Christmas Duck for dinner. So many of my Christmas Pasts were so much busier. My Christmas Eve days were often spent in the car or van making the long trip from Belleville to Chatham, while my Christmas Eves were enjoyed at Grandma and Grandpa's apartment in the retirement home. Grandma got shorter every year we went to visit her. They had an air purifier near the front door that blew out strange smelling air. Grandma made fantastic apple sauce, but her tuna caserole often left a little to be desired (for a non-fish lover, at least). She always had smarties and rosettes on a silver tray on the coffee table. The old-school exercise bike in their bedroom was entertainment for hours. Grandma and Grandpa always had suspiciously similar wrapping paper as mom and dad. One year, Grandma gave me an awesome puppet in a cone. Marya later broke it in the car before we even got through Toronto. We spent hours every Christmas eve running down the halls of their apartment building, rubbing our slippers on the carpets and shocking eachother. I spent many Christmas eves sleeping at their apartment on the pull out couch (that now resides in my mom's basement), listening to Grandma and Grandpa do devotions and quietly talk in the kitchen in Dutch. Marya and I or David and I would pretend to be asleep until they retired to their room, and then we'd talk and giggle for hours in the quiet dark livingroom where the only other sound was the clock on the wall. If I spent the night at Grandma's, we'd get up in the morning and eat breakfast and then, after putting on a special Christmas dress, all walk to church together. We would inevitably bump into aunts, uncles and cousins at church. If I spent the night at Aunt Joanne's, we'd all find our various places - sometimes we'd all 6 of us sleep in the basement - one or two in Brian's room, one on the cot beside the pool table, and a few of us on the floor in the area normally decked with old school desks, comic books and a freakish stuffed clown. Sometimes we'd sleep upstairs - mom and dad would sleep in cousin Julie's room and I would sleep in the walk-in closet - a room just my size! Aunt Joanne often had a few presents for us, which was VERY exciting! One year I got a book about Little Bear, and one year I got a book about a young girl who travelled out west in the wagon trains with her family and pet hen. We always got to have brown sugar on our cereal at Aunt Joanne's. They had so many awesome toys in the hallway cupboard. The best thing about being in Chatham for Christmas was the big family dinner that we would have: the Van Bredas, the DeVrieses, and the Dielemans (the Brouwer sisters and their families). So many people. So much good food. Fun games. Good singing. Noise. Talking. Laughing. Busyness. Good times. I always thought that Christmas would be a very busy time once I got married. But, we no longer do the Brouwer sisters Christmas dinners and Grandma and Grandpa are both gone, so we no longer go to Chatham. We have no Christmas obligations on Brian's side of the family, and we just get together for my immediate family celebration. Sometimes I miss the three different gatherings (my family, Grandma & Grandpa, Aunts). But it's also nice to have some breathing room and catch up on much needed sleep. However, every Christmas I do have those pangs in my heart to visit Chatham and the people there that I love. So many favourite memories in my life happened there. We've been busy here the past few weeks. 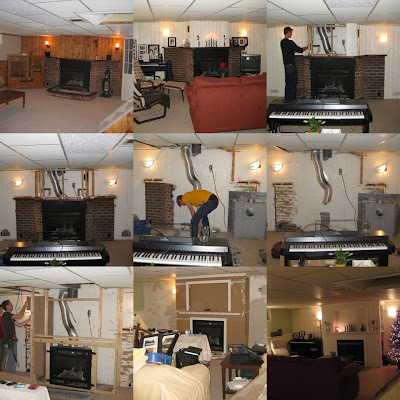 A look at the photo below will show you what our livingroom looked like before we moved in, what we changed it to, and then the work that has been done in the past two weeks. It's not finished yet - the mantle is only primed, and the walls are mudded but not painted - but I do think that it's quite an improvement! I like it a lot. Thanks to Nick Vanderheide and Dan vanOosten for helping Brian and I do this! Because it Made Me Cry. He knows when you sit and when you sleep. He knows your tangled thoughts; he knows them straight. and where you are when you're gone. he knows what you were about to say, what you meant. where God's Spirit won't comfort you, can't hold you. As your light turns to night, even this darkness won't hide you. God sees you clearly because because dark is light to him. And someday I too will awake with him, with you. From the December 2008 Banner. This coming weekend is an exciting weekend. Why? We have the chance to celebrate the birthdays of Mr Brian vanOosten (29! on Saturday, the 13th) and Mr Brian Van Dooren (26 on Sunday, the 14th)! 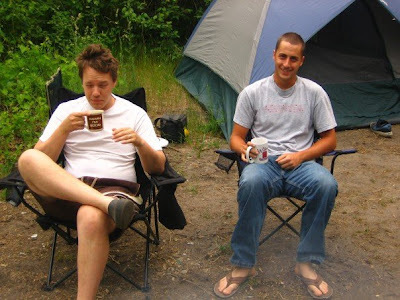 In honour of these two gentlemen, Laura Van Dooren and I would like to invite you to drop by, eat some food, drink some drinks, and wish the birthday boys the best as they enter a new year. Where? Home of Brian and Jenn vanOosten. Let me know if you need an address or directions. Please go through the gate at the end of the driveway to the back door. When? Drop by between 7pm and 10pm this coming Sunday, December 14th. This photo is most of us on Saturday night at MacNab. I suspect that the photo was taken as we were filing in after the intermission, as there is a lack of Dr T on stage and most of the sopranos on the right hand side are missing. If I was on stage, my head would be poking out beside the tall guy (Art Smit) at the back right in front of the doorway. The photo at the top of the post below is from Friday night's performance at Redeemer. There are so many things to write about this year's performance that I have trouble finding a place to begin. Perhaps I shall start with last night. Wow. Last night, we had the opportunity to sing at MacNab Presbyterian down town (Dr T's home church). What an acoustic space! From the first go, the choir was bang on (well, as much as the Redeemer choir can be). There was about a three second echo in the church, which was awesome. Chris (since he's my colleague now, I'm allowed to call Dr T that) was thrilled with the first few choruses, and his joy was reflected in our voices. We were standing in a U shape which meant that I could hear every part as clear as a bell. It gave me chills. We nailed the Amen, though I had a hard time getting through the last few notes as a) I was losing my voice in a bad way and b) I was really choking up. Also fantastic were the soloists. I would have to say that my favourite by far was Andrew Tees, baritone. He showed up at rehersal on Friday afternoon cracking jokes and dancing around the stage. He sang along with the other soloists as they rehearsed. He looked like a bit of a class-clown and had the aura of an NFL and NASCAR junkie - but when he opened his mouth and sang - wow. I believe I swooned. On Saturday evening as we were singing, he was facing my row and everytime the choir got up to sing he just looked as if it was the most exciting part of the evening. That was nice to see, as I couldn't actually see any of the audience from my back corner position. The soloists all expressed that while it was perhaps not the most technichally brilliant performance (no surprise there), it was the most passionate Messiah that any of them had been a part of to date. 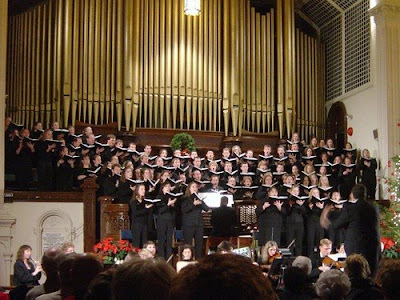 To paraphrase them (I can't remember their exact words), between them they had been in hundreds of Messiah performances and not once had they heard a choir that was so committed to what they were singing. They could tell that we believed this was a real story that we were telling, and that we all believed in the story itself. The alto thanked us for helping her enter the season of advent. 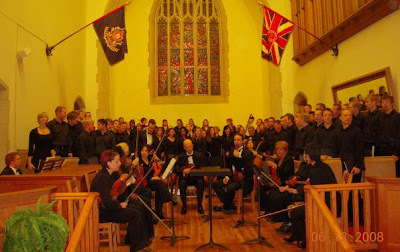 The performance on Friday night at Redeemer wasn't brillant - it was certainly a good show and we mostly did a great job, but, as the bass soloist said, it's like singing into a pillow in the Redeemer Aud. All in all, it was a great weekend. Having the experience of knowing the piece and not having to have my head buried in the score and worry that I'll screw up the whole evening really freed me up to listen, relax, enjoy, and worship. I look forward to next time. I'd love to sing the Messiah for Easter, sometime. Below is a blog that I posted on December 5th, 2004. This past week scared me, though, in terms of both the rehearsals and the performances. It wasn't so much the singing that I was scared of; it was the fact that half the songs I was singing, despite enormous amounts of time practicing on my own, I didn't know. My fears were embodied and brought to fulfillment in Friday night's performance. Due to my lack of knowing the pieces, I wasn't able to watch Dr T as well as I should have been, and I take a huge chunk of the responsibility of the Alto problems. I freely admit to messing up on my favourite pieces, "The Lord Gave the Word," and many other pieces. One thing that I will admit: the hallelujah chorus gave me chills. It was worth going through Friday night in order to sing that chorus the way that we did. The Amen, as most know, did not go so well. I don't know that there's much more to say besides the comment that was passed around at The Brassie on Friday night: "What a train wreck!" All day on Saturday, the Amen was not far from my mind. While getting ready for the performance that night, I must have listened to the recording of it ten times, not singing along with but feeling it. It sounds like a cliche, I'm quite aware of that. However, the sound that I was left with after Friday was not encouraging, and I needed to replace what was there. From the very beginning of the Saturday performance, I was excited. I could hear every single part of the choir: I felt as if I was a part of the choir, singing the choruses together, as opposed to Friday night when it felt (to me) as if we were all singing (some) of the choruses on our own, en masse. I had fun, and I could feel the presence of God among our choir, in the choruses and in the solos. Elation is the only word that would be fit to describe what consumed me a quarter of the way into the Amen. Well, elation, thankfulness and praise would be more accurate. I wasn't crying by the end, but my entire body shook as we sang the final measures, our director doubled over in tears. I have never been more thankful for the opportunity to be in choir. This year is the first year that the Christmas concert has actually been performed twice, and in my opinion (and knowedge) this is the first year that the second performance has been so needed. I realize that a majority of the audience on Friday night won't have realized that we absolutely butchered the Amen of the Messiah as few have done before. However, if that was the last note of choir for the semester, I shudder to think of how it would have affected our coming semester. As it stands now, there is not a choir member who did not put his heart and soul into what we did this weekend, and there is not a member who did not experience the gift that God gave us last night. That performance has already touched how the choir will come together to sing next semester, both on tour and in concert. Thanks be to God! Amen!